Hockey fans across North America are praying every night for this NHL lockout to end and for someone to budge. However, that has yet to happen. Fans are cringing of the lack of hockey in their area because maybe the only source of decent hockey is at the downtown arena watching the professionals play, like myself. 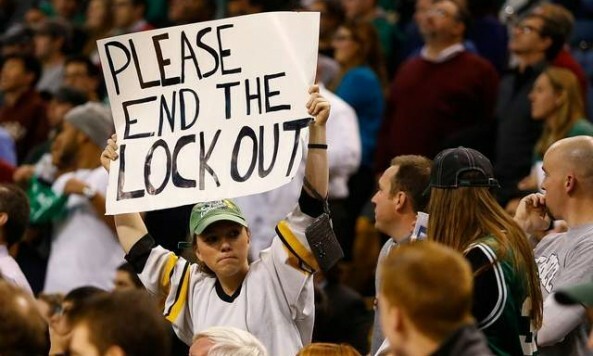 The lockout is affecting jobs at the arena, and hurting the local economies of the NHL cities. Bars, restaurants and other hang outs are not getting the same money they are used to getting at this time of the year. People are just trying to make ends meet. That is the real effect of the lockout. Even big market hockey teams are hurting. According to KSTP in St. Paul, Minnesota, Minnesota Wild home games bring in close to a million dollars a night for the downtown area. That stat shares similarites with the cities of Boston (Bruins) and Philadelphia (Flyers). “The labor dispute could lead to the city of Boston losing $850,000 to $1 million per game in local business revenue,” said president of the Greater Boston Convention and Visitors Bureau Pat Moscaritolo. For the case of the city of Detroit, local businesses are fortunate the Detroit Tigers made it all the way to the World Series, which gave some stability with the NHL lockout. “The economic impact for each Red Wings game lost is estimated between $1.5 million to $1.9 million,” said Michael O’Callahan, executive vice president and chief operating officer of the Detroit Metro Convention & Visitors Bureau. Thompson also called the result of the lockout a “dramatic impact” on the economy. Hotels, restaurants, bars and other local businesses are hurting because of the lockout. However, the players and owners do not care about anything but themselves and their dirty greed. On the other side of the lockout argument is what about the passion and love for the game? Apparently, that means nothing to those at the bargaining table. Or, is it a life or death situation if one–or both–sides lose a few millions of dollars? Well, Josh Harding answered that question when he revealed to everyone recently that he is in a potentially career ending situation. Harding, goaltender for the Minnesota Wild was diagnosed by doctors with multiple sclerosis two months ago after becoming dizzy and seeing black spots during an on-ice workout. According to the National Multiple Sclerosis Society, multiple sclerosis is, “A chronic, often disabling disease that attacks the central nervous system, which is made up of the brain, spinal cord, and optic nerves. Symptoms may be mild, such as numbness in the limbs, or severe, such as paralysis or loss of vision.” Also, the disease can cause loss of balance, vision problems and fatigue–all needed for a goaltender at the NHL level to be successful. Harding kept this a secret to everyone except his immediate family. Even though this a very serious illness, the Minnesota goaltender vows to play hockey once the NHL lockout is over. “I’m going to do my part over here, skating regularly, working out regularly, getting back into shape and hopefully be good to go for training camp,” said Harding. The passion and the love for the game is not only in Josh Harding but the hundreds of other NHL players and millions of hockey fans, just waiting for a new CBA to be agreed upon. The game of hockey isn’t about money. It is about the love, passion and will for the game. Fighting over just a few millions dollars will not break anyone’s back on either side. There is much more to life than money. Many people are losing jobs, businesses are going out of business and it is hurting the economy not only in the United States, but in Canada as well. The victims of this lockout is “Joe Sixpack” trying to keep his business afloat, when usually at this time his business is making money from hundreds if not thousands of fans who are about to head to the arena or are leaving the arena to get food or grab a beer to talk about the game. Yet no one on either side of the table has yet to look at the effect of the NHL lockout, but rather satisfying the avarice of the individuals involved in those meetings. Also, please NHL and the Players’ Association, don’t drag the fans into the middle of this lockout. Both sides–especially the players–have been preaching the message that they are doing working for the fans to end the lockout. Well, if they were really working for the fans to end this lockout, NHL hockey would be played right now.